A major part of most cardiac departments is the echo service. 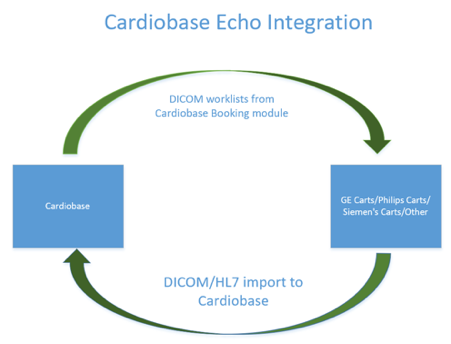 Cardiobase has a number of echo modules covering Transthoracic Echos (TTE), Transoesophageal Echos (TOE), Stress Echos and so on with DICOM worklist generation available from the Cardiobase Booking module. In addition, automated Results Out transmission for completed echo reports is available for a wide variety of target systems (Client developed Results systems, Cerner, iCM, GPs via their ARGUS or other feeder systems and so on). The time saved at each step can allow for increased throughput with more echocardiograms performed each day. It can help reduce waiting times for echos and can lead to prompt discharge of patients who otherwise may be waiting for a result prior to discharge. With efficient report delivery and more throughput beds can be freed up for other patients and get patients home on time.